The dcrandroid wallet for Android OS also saw its first release candidates available on the Google Play store. This benefits from Decred’s SPV mode which allows it to protect user privacy by requesting blocks directly from the P2P network instead of a centralized service provider - rare for mobile wallets. In addition to the caution about release candidates, please be aware that the mobile environment presents additional security concerns and is not advisable for large sums of DCR. Decrediton: v1.4.0 RC2 release features initial Trezor support, design improvements and many bug fixes. Initial Trezor support allows users to use Decrediton as a “watch-only” wallet that signs transactions with Trezor. The feature will be hidden behind a config option until it gets enough testing. Staking is not supported yet but is planned in the near future. More generally, watch-only wallets are now able to create unsigned transactions that can be transferred to another device for signing and broadcasting. Governance page received a large overhaul and an important feature to notify users about new proposals and votes. New page to choose between SPV and fully validating mode is now shown on first load. Initial dark theme can be enabled in Settings (the colors are being finalized). More details for these and other changes are in release notes. Politeia: latest security tightening earned Politeia an A+ rating from securityheaders.com, which placed it in the site’s top 3% and (briefly) in the Hall of Fame. A feature to view old proposal versions is added as part of a larger version diff viewer that needs more work. politeiavoter now retries failed requests which fixes Tor usage. Comment vote score calculation was fixed by moving it from politeiad to politeiawww. Proposals now cannot be abandoned after voting was authorized. These and smaller fixes will be available on the proposals site after the next deployment. Focus has been on streamlining the setup experience for new users since that’s the first thing they will see and can sometimes be tedious. In December the Treasury received 17,016 DCR and spent 12,570 DCR. Using December’s daily average DCR/USD rate of $17.5, this is $298K received and $220K spent. As these payments were for work completed in November, it is also informative to consider them in the context of the November average daily rate of $32.5 - in which case the USD received/spent figures are $553K/$409K. Rejected proposals: Radio ads (69% No), Decredex (96% No), Bcash’s ATM integration (89% No); participation varied between 24-31% of tickets. Discussions: this chat discusses staying frugal with the Treasury spending, especially during bad market conditions. This thread dismantled common arguments against Decred’s governance system: “we don’t know if the governance system works because it hasn’t failed yet” and “there hasn’t been anything controversial yet”. Turns out it’s hard for controversy to build up in a system explicitly design to avoid it. Hashrate: December’s hashrate opened at around 167 Ph/s and closed around 183 Ph/s, peaking at 207 Ph/s and bottoming at 110 Ph/s throughout the course of the month. For the most part, the average was 150 Ph/s. As of Jan 10, pool hashrate distribution: poolin 34%, F2pool 27%, UUPool 7.4%, btc.com 7%, Luxor 3.8%, BeePool 2.6%, coinmine 1.1%, others are 17% per dcrstats.com. Pool distribution numbers are approximate and cannot be accurately determined. There are many more interesting stats we’d like to present in this section, let us know if you can help. Bitmain’s Antminer DR5 miner was introduced on Twitter and met with some criticism. Specs: 34 Th/s at 1,800 W, prices start from $1,400. This thread discussed the unit along with challenges for small or hobbyist miners. 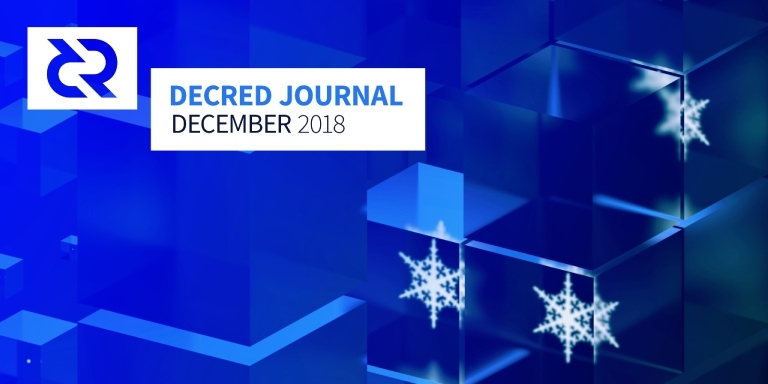 December marked an exciting month for Decred, as Ditto began work. The first initiative was to make introductions and determine workflow. You’ll now see our good friends, Liz Bagot (@liz_bagot), Trey Ditto (@treydpr), Margaret Mei (@margaret_mei), Blain Rethmeier (@blainr), and Milvian Preito (@milvian) in various Matrix rooms, including #marketing, #ditto_pr, and #writers_room. Work began in earnest on messaging, which can be viewed here. Continued input is always valued. Concurrently, we’re working with the design team to integrate new messaging into the site and to expand the content with new pages further explaining important aspects of Decred. Trey published Ditto’s big picture look at 2019 and the strategy for Decred. Following that a survey was held on Reddit asking the community how would they describe Decred, what media do they read and how they think Decred should target developers. Created a foundational messaging platform containing a breakdown of Decred’s audiences, an about section, a mission statement, a vision statement, and positioning statements for each unique audience. We submitted the messaging platform to the Decred community for feedback and intend to do another iteration of the document that incorporates the feedback in January. Attended and sent reporters from Breaker Mag, Forbes, and Fortune to Decred’s meet up in NYC. We pitched Jake’s commentary on 2019 crypto predictions with crypto reporters and secured coverage in NullTX, Crypto Briefing, The Daily Hodl and CCN. Decred held it’s first meetup in New York City on Dec 5 at Distributed Global in the flatiron district in NYC. The audience of about 80 people included VC’s, developers from other projects, media, and members of the Decred community. @jy-p gave a Decred overview presentation (photo), then delved into the technical details of the Politeia Proposal System including how it works and the potential breadth of its applications. Next, Chris Dannen, Founder of Iterative Capital, discussed the way work has evolved, particularly in the era of free open-source software. Iterative Capital’s Thesis explains this thinking in much greater detail. He explained how Decred’s treasury brilliantly dovetails into a massive work trend that gives workers desired autonomy and enables them to do their best work. Joel shared his appreciation for Decred’s governance system, and its ability to make Decred polymorphic, adding features and functionality as the community decides. They concluded that Decred is built/designed for a multi-decade horizon. They shared some of the good work they’re doing to on behalf of Decred with respect to custodianship, exchanges, and institutional staking, and concluded that the biggest issue Decred currently faces is liquidity. Founders Night took place next day on Dec 6, and was Distributed Global’s holiday party. They brought in all their fund managers from various offices, and invited their investors, partners, and members of various projects within their portfolio. It was a great opportunity to meet those various constituencies and build relationships for future events in NYC. Spring is being targeted for the next Decred event in NYC. TabConf in Atlanta, USA on Feb 8-10. @moo31337 will present “Decred 101: An introduction to Decred” on Feb 9. The North American Bitcoin Conference in Miami, USA on Jan 16-18. @jy-p will present Politeia and explore a wide variety of applications that could utilize it. Please message @Dustorf if you’re interested to help out at the show. Jalisco Talent Land in Guadalajara, Mexico on Apr 22-26. Decred will have a booth. @elian will present an overview of Decred with Q&A, plus there will be walkthroughs how to use software and vote. Contact @elian if you’re interested in helping/attending. Prototype community issue tracker was started to discuss actionable ideas in a more structured format. Any idea that benefits the project can be discussed. As of Jan 10 there are 73 issues like article ideas, PR, archiving and data preservation, or discussion of communication platforms. For example, this issue captures a challenging task to find a good name for Decred’s hybrid PoW/PoS consensus algorithm and lists all options suggested so far. You can subscribe to everything with the Watch button on top, or to individual issues with Subscribe button on the right panel. There is a popular belief that “GitHub is for developers” - this is not the case. Posting issues and comments and ‘+1’ is no harder than using Reddit or chat and in fact multiple non-developers already contribute doing just that. Reddit incident showed us another weakness in the platform. Multiple threads were started and spurred useful discussion, but were later removed by the author. This wasted the effort of all people who bothered to reply. The deleted threads were somewhat resurrected, but generally this incident shows an attack/sabotage vector: trigger the discussion and then delete the thread, wasting community’s energy. Reddit has no defense from this as moderators cannot disallow users to delete their content. The event has led to a discussion of a Reddit replacement that could probably derive from Politeia. For yet another time, a lot of strange Reddit activity was timed close to our major release. It is either an unusual amount of questions about less relevant issues, or “innocent” questions about trivial things, or something similar. All coming from accounts never seen before and that stay after the short interaction. This notice is to inform people who care about the project to watch out for weird activity that can sap project’s, as well as your individual energy. Read this chat for more details. The first round of voting on Aragon Governance Proposals (AGPs) has been delayed due to potential network instability around the Ethereum Constantinople hard fork - hopefully “blockchain down for maintenance” is not a problem Decred will encounter with Politeia. The CEO of Aragon Association published a blacklist and wishlist for proposals before proposal submissions opened. In the first proposal the AGP process itself was approved by 99.97% of the ANT that voted. In total 2.6% of all ANT tokens voted on the first proposal, from 45 unique addresses, with ~60% of ANT votes coming from one address. AGPs go through a review by the board of the Aragon Association, then a community review, before a 48 hour voting period opens. 2 million BTCP were mined via an exploit and went unnoticed for months until CoinMetrics noticed that something is wrong with the supply. Developer team posted an official statement confirming the inflation exploit. The bug was merged on Jan 5 2018 together with a patch from a bounty hunter that disengaged after receiving the reward for his work. Just one missing line of code caused huge damage to the network’s value proposition. We can learn a lot from this unfortunate experience: extensive test coverage, super critical review of consensus code, established reputation of developers working on mission critical parts, and having multiple implementations of the protocol are all very important to build a system we can trust money to. There was an attack on Bitcoin’s Electrum infrastructure. Someone started a lot of malicious Electrum servers that prompted the user to “upgrade” to a malware version and stole 200+ BTC. The Electrum model involves a network of servers that sit between clients and full nodes. Each client depends on the server they connect to, this compromises user privacy as the owners of those servers can infer which wallets the users own. If Electrum servers were compromised this would open up some additional attacks. Decred chose not to develop Electrum infrastructure but instead go straight for SPV based on client-side filters. This delayed the development of light clients, but the SPV mode now working in dcrwallet, Decrediton and drcandroid connects to full nodes directly and functions independently of any service provider, which enhances users’ privacy as a result. Coinbase seeks to own the term “BUIDL”. There have been a number of articles in December about layoffs in the cryptocurrency space (and some saying it’s not so bad relative to other sectors). For other projects with Treasuries, these are also hard times, as noted for Horizen above and can be seen in some Dash community discussions. We can thank the people who managed the Treasury in the pre-Politeia era for its healthy balance, this is the reason that Decred is still looking to expand its workforce while other projects contract. With DCR at $17.5 for December, that will likely be the first month where Treasury outgoings are greater than the incoming block rewards. Even if DCR/USD stays low for some time, the Treasury could maintain its current USD-equivalent spending for several years (rough estimate is 8) at this rate before cut-backs became necessary. Copernicus is an implementation of the Bitcoin Cash protocol written in Go that utilizes btcsuite. The pre-release version of software was announced and mined its first block in December. On their website the authors thank btcsuite developers for their work and acknowledge their contribution to the Bitcoin ecosystem. On the blog Copernicus team noted that the software “reorganizes and redesigns the software structure for the original client in order to make the structure more concise, reduce the learning difficulty for developers and increase diversity of clients to ensure safety of the entire BCH network”.